It's like having additional staff without the overhead when we are busy. With four locations in Nevada, Nacho Daddy is “Nacho” typical eating and drinking establishment. Don’t let the name fool you, this place does a lot more than offer an eclectic choice of Nacho dishes. They can be described as, “An American Grill with a Mexican flair”. If you enjoy tequila, there are over 60 varieties of the spirit derived from the blue agave plant. Their focus is on providing their guests with creative food pairings that are only made from the highest quality ingredients and in most cases, locally sourced ingredients. This creates an eating and drinking experience that their guests appreciate and come back to enjoy time and time again. Their newest venue, located at 9560 W. Sahara, is also the home of their first self-serve draft beer system by PourMyBeer. Self-serve beer first hit Las Vegas in 2010 in the form of draft beer tables and has been evolving ever since. 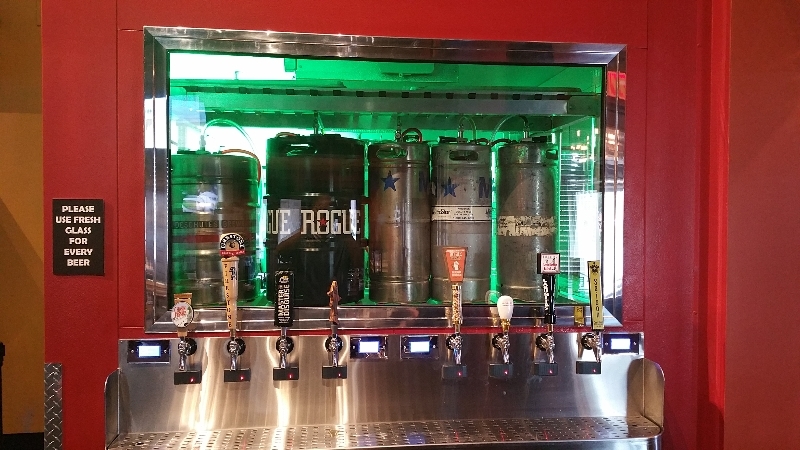 The kegs that supply beer to the self-serve taps are conveniently positioned directly behind the taps. The guests can see the kegs they are pouring from through an air sealed window into the illuminated keg room. Consumers have a plethora of choices for where they want to spend their money in Las Vegas. The Self-Serve Beer Wall at Nacho Daddy gives locals another reason to choose Nacho Daddy as their destination for the evening. From an operational perspective, the staff gives the customers access to beer only after they've verified their age. Responsibility is built into the system to prevent unlimited access to beer. First, the customer decides whether they want to purchase a pre-set dollar amount from $10 - $50 or they can open a tab and pay the bill at the end of the night. Once this is determined, the guests choose the beer they want, scan their beer card next to the tap of their choice and pour the amount of beer they want to. They get charged by the ounce, so they only pay for what they pour. It’s a win/ win scenario for everyone involved.